Universal Document Converter is a useful and powerful conversion tool, which can convert Word to .JPEG images using the original document formatting. This simple converter is a virtual printer, which means you can convert your files as easy as if you would print them. Microsoft Word allows you to save documents in several formats, but the JPEG format is not one of those formats. 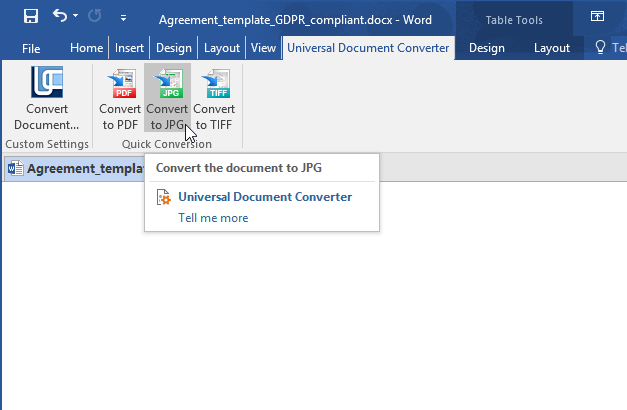 There are many ways to save a Word document as JPEG, and Universal Document Converter is one of the simplest Word to JPG converters. Which Word to JPEG Converter is Better? Download and install Universal Document Converter. Open the document in Microsoft Word and click File > Print. 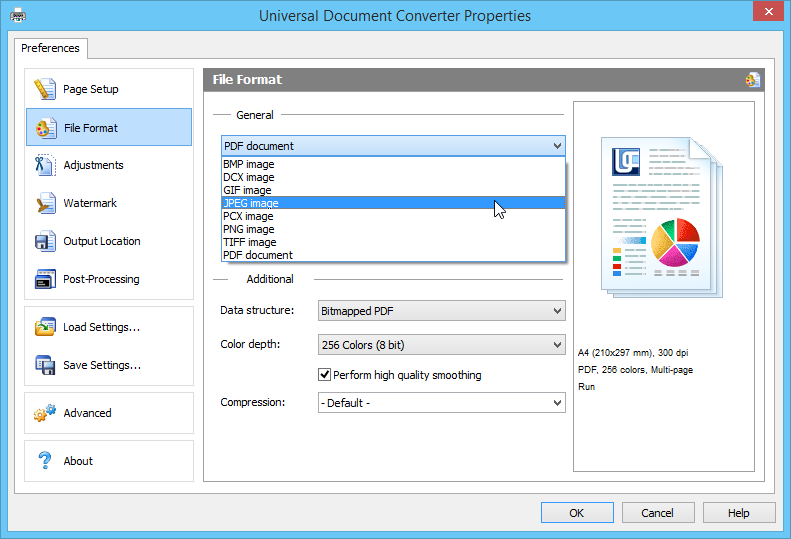 Select Universal Document Converter in the list of printers and click Printer Properties. When the conversion to JPEG file is complete, the output files will be saved to the Documents\UDC Output Files folder (by default). Convert your Word documents to JPG, PDF or TIFF in one click! Just use quick access buttons in Microsoft Word toolbar. These buttons instantly start file conversion to JPG, PDF, TIFF or other formats with pre-defined settings: original page size, True Color (24 bit) and 300 DPI resolution. If you missed to turn this feature on during installation - check the box next to Add toolbar to MS Office in the Advanced tab. Open a Word document which you wish to convert to JPG. 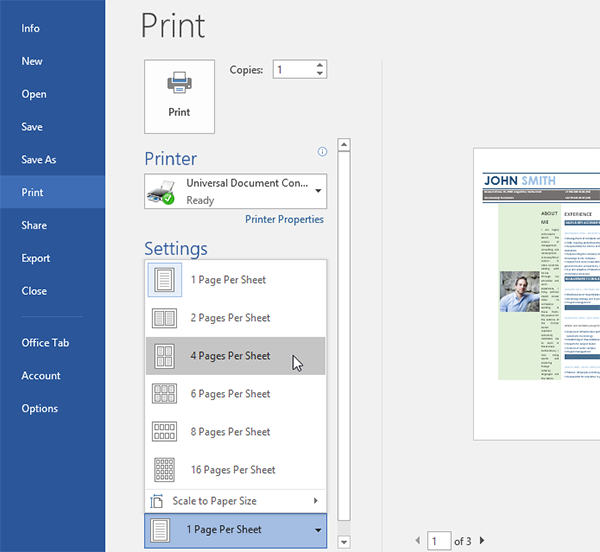 Click Print and find option 1 Page Per Sheet in the Settings section. Go to File Format and select JPEG. DocuFreezer is a handy lightweight software for converting documents to PDF, JPG, TIFF or PNG formats in batch mode. The program is very simple - you can just drag-and-drop all Word files, select JPEG as output format, click Start and go get a quick coffee (or tea?) drink while the files are being converted. Many filetypes besides Word are also supported. Come back soon though, because the program works pretty fast thanks to its powerful processing core. Q: How can I keep the background color or background image when converting a document from Word to JPEG? If the background of the document doesn't print properly, open the document, click Print > Page setup > Paper > Print Options... > Display and enable Print background colors and images option. Q: I need to batch convert about 150 documents daily from Word to JPEG format. How can I automate this task? 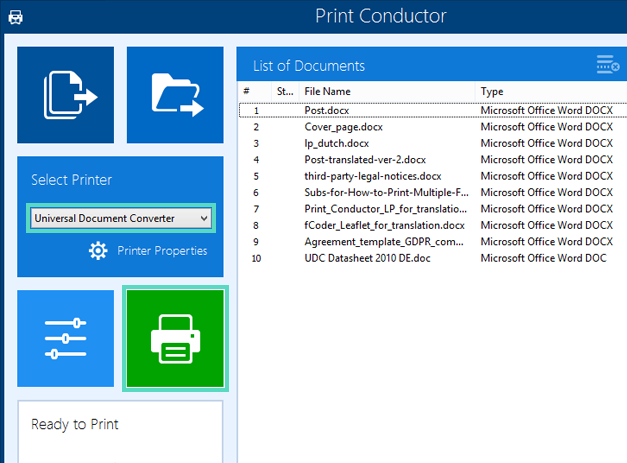 Print Conductor software can print Word documents in batch mode. If you select Universal Document Converter from the printers list, PrintConductor will use it for converting documents from Word to JPEG instead of printing them on desktop printer. You can also use DocuFreezer for the same task. Q: Can I convert Word to JPEG without Microsoft Word installed on my computer? Universal Document Converter uses Microsoft Office public API for converting documents. Microsoft Office software is usually used to open .doc and .docx files, but having Microsoft Word is not a must. You can use Microsoft Word free alternatives such as OpenOffice or Libre Office to convert them to JPG format using Universal Document Converter as described on this page. Q: I need to automate converting of documents from Word to JPEG myself using VB.NET. Do you have any examples? Yes, you can find source code examples for Visual Basic and Visual C++ in Developer Solutions section of Universal Document Converter's website. Overall, Universal Document Converter is an easy to use solution with a wide variety of functions that supports various conversion formats. 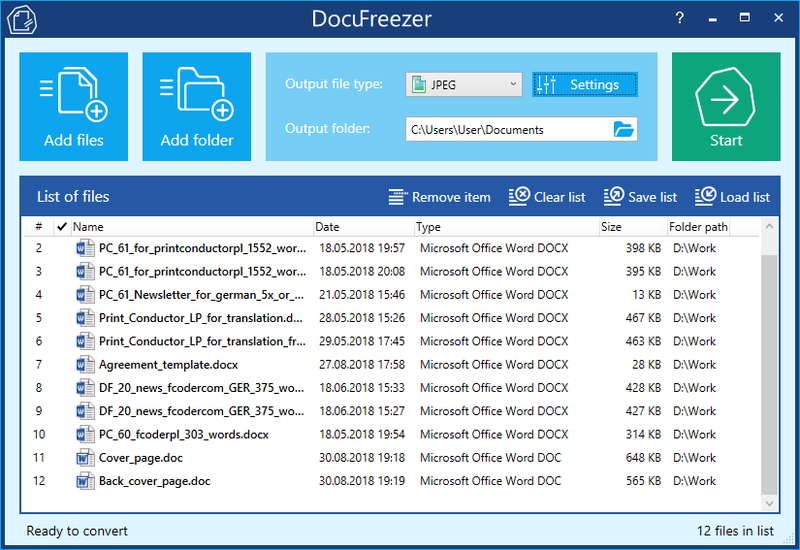 DocuFreezer will help you convert files as well and can convert multiple files in three clicks, but without many flexible settings. If you need both - a variety of settings and ability to convert multiple files - team up Universal Document Converter with Print Conductor!